Ok, its the faux ABCO Westy but they have Philips make these U bents for them, on the very same machinery that once brought us the great ol black ended U bents. Yep. I saw some F40's a while ago at Marvin's, but I couldn't afford to get them at the time. That was about a year ago. The quality of that etch is astounding. yeah that's the quality of a current GE etch lol. Just scratch the green etch off and rewrite it in black. Thin glass like all modern Phillips tubes? Look at the state of that etch! Will this seriously do 18k hours? Ah, are we sure this came off the same machinery as the old blackenders? Take a closer look where it says "made in Mexico." Philips shipped the machinery to Mexico. I bought a pair of Mexico Philips FB40 Cool White Plus or something like that from HD. They look more like /CWX....sort of purplish and thin phosphors, also no cathode shields. 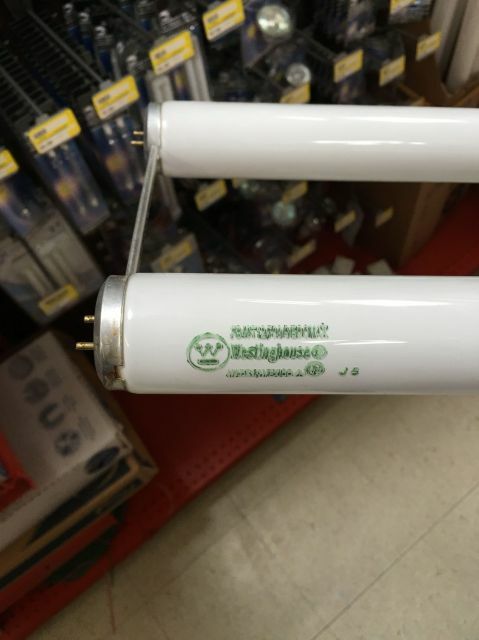 Do these have cathode shields? Nope no guards. And Westinghouse stems and lead shapes. Cool find as long as they don't go mercury starved. Those green etches always scare me, lol. The Mexican Philips full wattage FBT12s are usually pretty good, lasts about 6-7 years in commercial use. The age marks are Westinghouse.